You may be kicking your heels, but The Hamlet are back in action on Tuesday! 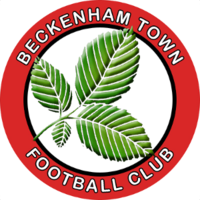 Beckenham Town is an easy ground to get to, only a few minutes walk from Eden Park station, which is on the Hayes(Kent) line from central London. The ground is a tidy venue, well respected throughout non-league football in the south-east of England for its excellent playing surface. There are small stands on both sides of the ground, and areas of cover behind the goal at the clubhouse end, as well as along the sides. The covered standing areas, incidentally, were salvaged from the remains of the old Fisher Athletic ground, at Salter Road, in Rotherhither, where they formed part of the Dockers Stand. It takes around 35 minutes from central London, with departures from both Cannon Street & Charing Cross. The last trains, to arrive from them to make kick off are the 18:40 & 19:00 from Cannon Street; or the 18:49 from Charing Cross. Lewisham, New Cross and Catford Bridge are pick-up points. The Cannon Street trains stop at Lewisham, with the Charing Cross ones stopping at Ladywell, not Lewisham. Coming back, if you return by train, the first one after the match back toward central London is the 21:37, if you’re nifty at the final whistle, or the 21:50. After that they are at The last train back to London will be the 07, 20, 37 & 50 past the hour, with the last train timetabled at 23:37. There is a nice little bar & tea bar inside the ground, while out on the main road, as well as few shops, is the Eden Park Toby Carvery, which is popular for pre-match food and drink with quite a few of our fans whenever we visit. Not far away, but sadly closed on Tuesdays, but still worth a mention if you are in the area another time, is the Bethlem Museum of the Mind. If you venture a mile away or so onto Beckenham High Street, for those with pre-match time on their hands, there is a variety of local and chain shops, as well as several eateries & pubs. If you’re into unusual architecture keep an eye out for the Chinese Garage, now a listed building. It is built in an unusual Japanese pagoda style. Worth a visit if you like churches is the parish church of St. George’s, not too far from Beckenham Junction station. It’s 13th Century lychgate is said to be the oldest in England. There is also an Odeon in Beckenham, by the War Memorial roundabout, if you fancy a film in the afternoon. And the building is Grade II listed. Beckenham has also had some famous residents in the past, including David Bowie, Bob Monkhouse & Julie Andrews. Former Southwark boy David Haye, the well-known boxer, lives in the area & many a Hamlet fans childhood sweetheart, Floella Benjamin, of Play School fame, grew up in Beckenham, originally from Trinidad. In 2010 she became a life peer & sits in House of Lords as Baronnes Benjamin, of Kent.  FA Trophy draw made Following on from last season's brilliant run all the way to the quarter finals we know who we will play in this years first qualifying round. Committee Meeting - May Minutes  We are pleased to publish the minutes of May's Committee Meeting.